I have been active using email with HT this week. His company does not track food cost using a percentage target. This is the way we were trained in my role as operations auditor with Sodexo on remote site feeding projects. HT works on a drilling rig. Although most North American remote sites from my days in the 1980s are now cities and towns with airports, shopping centers and good roads, drilling rigs will always need support services. We have emailed each other in order to clarify the billing policies on his contract. Unlike our contracts which allowed billing for a full manday as long as a resident attended at least one meal, on HT's jobs they only bill for the meals attended. The clarifications and a revised spreadsheet follow. Q. So 1.5 is 15% of 10. We expect breakfast to be 15% of food consumed. This is what I call a target (a goal). Q. The count for each meal just explains how many showed up for the meal. What if someone only came to a single meal but ate like a horse, do we get a complete manday? or only the 1.5 divided by 10 if breakfast? A. He will be calculated at the times he would eat. If he attends breakfast only then YES 1.5 divided by 10 for the numbers who have attended the breakfast then the number of those attending lunch and so on then we add up all and this would be the MEN ON BOARD count since there is a price for each of the meals. Q. On our jobs, if they ate even one meal we billed the entire day. This is one part I do not understand for your project. A. You see, that's why the lunch is the most expensive cause we would have low numbers and even near to steady numbers on all meals except for the lunch where there will be visitors. 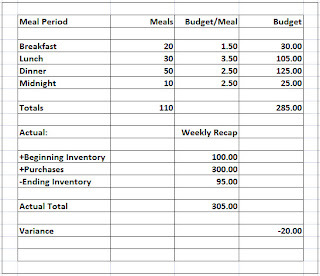 The resulting control model carefully tracks the budget per meal applying the correct target cost per meal. This analysis shows the maximum food cost total which will meet our budget target. The actual food cost is determined by the traditional formula [Beginning Inventory + Purchases - Ending Inventory = Food Cost]. Returning to our previous example, I have added the actual cost data and a variance field. For those of you who live and die by the FC%, you may find the meal method helpful. I like the meal method to test the impact of dayparts on the food cost results. The focus is on dollars (or your local currency) vs. percentage. Your percentage results will improve by adding this tool to your kit. 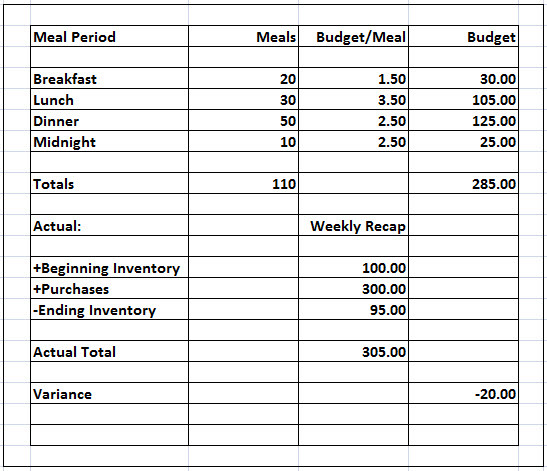 When you track your costs by meal, you will develop a food cost system which will produce a true variable cost. Fluctuations caused by seasonal issues and busy day/slow day issues will be eliminated. You may need to track your employee meals more carefully. We treated each employee meal the same as a billable meal. The idea is to track your food used based on a budgeted cost per meal. Most POS systems will have a report which recaps the check average by meal period. These check averages will help you develop a per meal budget. Changes in customer habits (like a shift from soft drinks to complimentary tap water) are easier to track. Customer profiles will help you think through the menu pricing decisions in a strategic manner. The QSR operations have done a great job developing value meals. I have always been a fan of the table d'hote option for dinner houses. Try tracking your costs by the meal or guest and you will see your food cost in a new light. I need to know why the other costs of the catering like manpower,gas consumption,rental charges,water etc are not taken into consideration to find the actual cost of food & catering. Why other costs like manpower,water,gas etc are not cosidered .